Helping you get the greatest landscaping results for the greatest value is my overarching goal. Because I have managed the maintenance work at a number of homes and estates on the Peninsula, I can help you save time and money in the long-term by making smart choices in the planning stage of your project. If requested, I can also proactively id pest and disease problems you may not even be aware of, and recommend organic maintenance techniques to improve the overall health and beauty of your gardens. Streamline Design Consults: Many homeowners simply want to update and make changes to their existing gardens, including taking out the lawn. They’ll either do the work themselves, or they already have a contractor in mind. They’ll need to figure out a general idea of the new layout; make hardscape and irrigation decisions; consider whether to add water features and other garden art; and figure out which plants they should buy to achieve the results they are looking for. For them my Streamline Design Consulting service makes sense. My fee for a consult is $300. If you would like me to stay longer than 2 hours, I charge $100/hour thereafter. By the time we are done, you will have a very good understanding of some interesting changes that you can make to refresh or rework your outdoor spaces. This is an economical and practical design approach that costs far less than what a traditional landscape planning service costs. Master Landscape Planning: Other homeowners are in the process of a home remodel, or are constructing a new home from scratch. They may or may not be pulling permits for the job, but they will need to choose a landscape contractor to handle the installation of hardscape and plants. 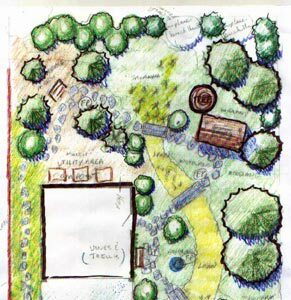 For these clients I go through a more traditional landscape planning process, including preparation of detailed Concept and Master Landscape plans. To see photos of some of the jobs I’ve done, please go to the Projects section. 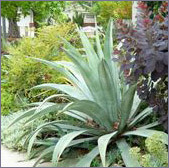 Working with realtors and their contractors to stage gardens cost-effectively prior to sale. For additional information about these services, including costs, please either give me a call at 650-302-5379 or send an email to: karen@hunt106.net.